Oracle WebCenter Portal is a suite of portal and composite applications that delivers intuitive user experiences for your enterprise perfectly integrated with your enterprise applications. 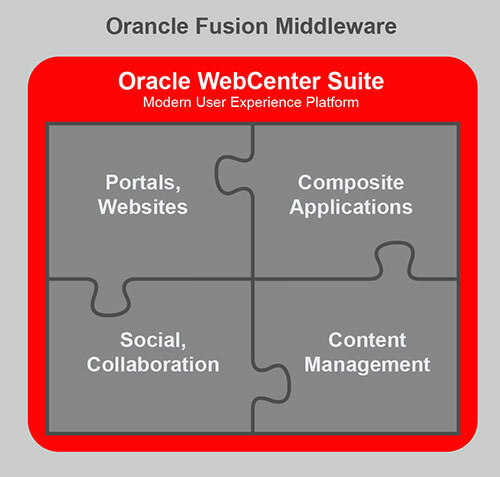 Oracle WebCenter Portal allows users to easily create dynamic portals, intranets and extranets. You can create out-of-the-box communities, allowing you to create organizational environments work to connect people and content. Custom panels for users to monitor performance and minimize the page transitions, integrating information. Connect to applications through implicit integration with Oracle Applications, Oracle Fusion Applications and other enterprise applications. Content management with unified repository.